More Jobs, Cheaper Gas And Rising Stocks Help The Economy Look Up : The Two-Way The U.S. economy turned up encouraging signs for most Americans. Workers can now find more jobs, and drive to them using cheaper gas. And retirement accounts are getting a boost from rising stocks. Prices for both gasoline and natural gas have fallen this year. 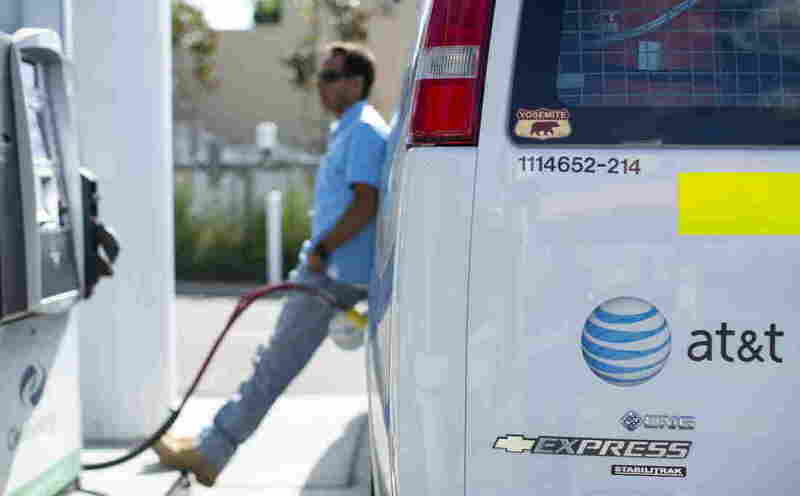 An AT&T employee fills up his company van in San Diego last month. No question, this was a traumatic, sad week because of the mass shooting in San Bernardino, Calif. It's not easy to turn to good news. JOBS: Employers added 211,000 jobs in November, the Labor Department said on Friday. That's a healthy pace. Except for the manufacturing sector, the U.S. economy is now "much more vibrant," said economist Bernard Baumohl of The Economic Outlook Group. STOCKS: Share prices surged after investors shrugged off worries about a looming uptick in interest rates. The Dow Jones Industrial Average closed at 17,848, up 370 points, to end the week with a gain. CONSTRUCTION: The Labor Department said that last month, construction companies hired 46,000 workers, mostly to build homes. The housing sector has very low inventories, so this fall's construction hiring suggests there could be a burst of residential sales in the spring. WAGES: Average hourly earnings continued their upswing, rising nearly 0.2 percent last month, for a 12-month gain of 2.3 percent. ENERGY: Gasoline prices kept slipping, down to a national average of $2.047 for a gallon of regular gas, compared with $2.728 last year, according to AAA. And the government reported record inventories of natural gas. Amid the natural gas glut, many utility companies are cutting the prices they charge residential customers. EUROPE: On Friday, European Central Bank President Mario Draghi said he would support more stimulus efforts to keep the European economy growing enough to hold off deflation. CONGRESS: Both the House and Senate gave final approval to a $305 billion, five-year highway bill. The package, which was signed by President Obama, will provide more jobs and stimulus as transportation infrastructure projects move forward. Sure, there's bad economic news out there, too. Exports are being hurt by the strong U.S. dollar. That is depressing factory hiring. And many other countries are still underperforming, especially China. Energy companies are having to lay off a lot of people amid surging supplies and slumping prices. So yes, the U.S. economy is never perfect. But this week, it did see a lot of reassuring signs. And with a week like this, Americans could use some good news.